March 12, 2010 Today I soared through my first ever Virgin Airlines’ experience bemused by two giddy tween girls excitedly chirping to their mom about the pink and purple “mood lighting” befitting a nightclub and the free WiFi and touchscreen inflight services, as she flashed me one of those, “Where do these girls hear this stuff?” mutual-mama looks. I wanted to ask if they were headed to the AllyKatzz Tween Town Hall event in L.A., but as usual, I was on the fly trying to eke out one last text to wrap up loose ends, and lost them shortly after boarding, only to find myself immersed in fascination with a college student doing a piece on “Escapism” via one way ticket from one coast to the other, using social media to make her way back to NYC. As fully enthralled as the tweens were over the digital doozies and ooh-la-la hipster fascination, my new collegiate gal pal, Amanda appeared to be quite the opposite…She proudly proclaimed she not only did NOT own a TV, she ‘knew herself well enough’ to resist the temptation of a time sink when she could be out…literally travelling the nation. “Time to make use of all those Facebook connections,” Amanda smiled, admittedly reticent about asking for local resources and hotspots across the country at first, much less try couchsurfing, but then finding huge value in hand-selecting each lead with meticulous care. Fascinating how different ages and stages use media to work FOR them rather than so many adults (including myself) feeling like we’re deluged struggling with ‘tmi’ trying to tame the beast to keep media from controlling US. I’m stumbling on branded tchotchkes from baubles and charms to my breakfast banana (a Wii Super MonkeyBall sticker for some promotional tie, though she said she’d never noticed it so that one was a red herring) and I just tripped on a wellworn pair of Juicy Couture tennies, realizing I’m not in Kansas anymore, Toto. This is L.A. to the max, and I may need to unwind after the AllyKatzz tween town for some Vitamin D, mental floss, and calming sound of the surf tomorrow after cueing up some questions for MY favorite part of this event, which will be the ALLY Awards, focusing on wunderkind social change agents using innovative initiatives to make a difference in the world. How can all the hype, hope, and help peacefully co-exist at one massive Tween Town Hall? I’m about to find out. Stay tuned for many shades of pink and purple ascending, with a dash of Code Blue, Reviving a Generation, powerful eco green at GYM (Green Youth Movement) and Denim Messaging (DM for social change) at what will no doubt prove to be a brilliantly colorful day. Announcing the first ever A.L.L.Y. Award Winners – tweens/teens who founded their own non-profits – who will be at the Town Hall Meeting on March 13: Code Blue, Inc., Cupcakes for Cancer, Green Youth Movement, Kids Helping Kids, Kids Who Care Foundation, One is Greater Than None, and Step by Step. 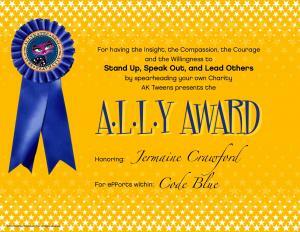 CertifiK.A.T.’s of Achievement go to Alexandra Rose Rieger of In a Perfect World, Emerald-Angel young of Tea Party Angels, Megan Kilroy of Team Marine and Johna Rivers and Toni Gutierrez of Actionist Network for their efforts within larger organizations. I feel so fortunate to still be alive and happy! I know how it feels for sick children around the world. I know the feeling of fear – the thinking that you are still in that nightmare and you are wishing you are going to wake-up any second. That is why I want to help chemo patients because they are the bravest! That is also why I started “Cupcakes for Cancer”. If I could make just one chemo patient happy or just put a smile on a face it would mean everything to me! ”Cupcakes for Cancer” has been created so children like me everywhere can work on “making a difference” in a chemo patient’s life! Even though my experience was tough, I would never trade it for anything because it made me who I am today! I’ve became a better person all around and I am emotionally stronger and hopefully I’m becoming the girl God wants me to be! When it seems there is no way out of an unfair situation -don’t give up – there is something in store for you later on, along your journey to happiness! Through the good and bad times just think of what is in store for you at the end of YOUR rainbow!! As the founder of local nonprofit, the Green Youth Movement (GYM), 17-year-old Ally Maize has often been called “Los Angeles’ Resident Green Teen.” Ally first founded GYM at the young age of 15, shortly after watching Al Gore’s An Inconvenient Truth. Inspired by the idea that kids and teens can do great things for the environment, Ally discovered her passion for educating her peers on environmental awareness. For Ally, small daily changes towards sustainability can make a big environmental impact. Ally’s passion for green living has set a perfect example to her peers, and has helped many teens start their journey to creating a more eco-friendly world. Tyler Page is a creative 13 year old who is always making his family and friends laugh with his witty sense of humor. He started his own non-profit organization at the age of 10 after watching an episode of Oprah on child trafficking in Ghana, West Africa in February 2007. His unique organization evolved from a pull on his heart combined with a simple idea to have a car wash in the hopes to raise $240. Three weeks later, he had that car wash and after raising $1,200 decided that he couldn’t stop helping the children in Africa. This is what turned his simple heart-felt idea into a fundraising and leadership movement for global transformation. After reaching Tyler’s $50,000 goal we officially launched our leadership academy. Every June-August we launch a lemonade stand challenge opened to every child across the world and we vote on one of our projects that the money will be allocated to. At our leadership meeting we teach them “How to run a successful lemonade stand” where we teach them about goal setting, budgeting, location, display, marketing and advertising. They get to be as creative as they’d like and it doesn’t have to be a lemonade stand – it can be any “small business” they are passionate about such as a bake sale or sports equipment, etc. The idea is to get them thinking about planning, execution, creativity and the process. Risha Shukla, then a 7 year old who underwent an Auto Islet Cell Transplant in March 2004 for Chronic Pancreatitis, understands very well the challenges of being in the hospital room and staring at the bare white walls! The Kids Who Care Foundation, a 501c3 tax deductible non-profit foundation, was founded by Risha with the help of her parents to cheer up and support other children with Pancreatitis and other chronic medical conditions. Kids Who Care’s mission is to brighten the days at the hospital for kids that are having major surgeries. Kids Who Care volunteers send out “smile packs” to children in the hospital and Ronald McDonald House nationally to brighten the days of the hospitalized children. The “smile pack” box contains a giant “quilt cards” consisting of 20 “cheer up” cards made by the caring youths, along with books/DvDs, toys, board games, etc to bring a smile and make the hospital room bright and cheerful! Over 10,000 “cheer up” cards have been sent to kids in hospitals with the help of over 1000 volunteers! In the spring of 2007, the girls saw an Oprah episode and were shocked to see children from Ghana, Africa, being sold for as little as $20 by their families, unknowingly, into a life of servitude. They were heartbroken. Ghana was so far away but the International Organization for Migration (www.IOM.int) was making it possible for people to sponsor rescue missions that would save trafficked children from a life of hard labor and abuse. The girls found out it would cost approximately $4300 to save one child from these inhumane and brutal conditions. The children are provided with rehabilitation, and are reunited with their families. This would include 2 ½ years of counseling, career training, education and healthcare. The girls decided to make bracelets and package them on cards that would educate people about what was going on in the fishing villages of Ghana. In response to our national healthcare crisis, the girls wanted to see how they could make a difference in the USA. They were excited to learn about an organization called Remote Area Medical (RAM) that supplies free medical care to impoverished rural areas. 1>0 is committed to sponsoring full weekend clinics. To date the girls have raised in excess of $120,000.00. Step by Step was started by Avery Hale upon seeing photos of shoeless children living high in the cold and rocky Andes Mountains of Peru. A desire to donate her own shoes to them quickly developed in to numerous shoe drives, community dances to raise awareness, regular donations from the North Face and Keen Footwear, and a plan to deliver shoes to impoverished villages all over the word. Avery saw a need and got to work. Since 2006, shoes have been donated to impoverished villages in Peru, Ecuador, Costa Rica, South America and Haiti. Avery is a sophomore at Marin Academy and a typical teenager who juggles academics, social life, soccer, tennis and of course, Step by Step. She was recently the recipient of the Art of Activism Award by the Redford Center (www.redfordcenter.org). With growing momentum and a seemingly endless supply of shoes from the community, Avery plans to continue the mission of Step by Step for years and years to come. Her hope is to inspire others to find something that they can do to make a difference in the world. One step at a time. Alexandra Rose Rieger (actress)- Ambassadors offer young people a wonderful opportunity to serve as liaisons between community youth and the IAPW® Foundation, and actively represent their region for a one year term. Ambassadors are skilled volunteers responsible for keeping in contact with IAPW® alumni and coordinating projects to improve their community. The Ambassador Advisor, a member of the IAPW® staff is available for support for all Ambassadors. Ambassadors will work in a broad range of areas that include health, environment, gender, justice, and education. Youth are powerful advocates for any cause! The Ambassadors will encourage all young people to take action and make a difference. We believe that when we give children the platform and experience to allow their dreams, ideas, and thoughts to be heard and shared, their innate desire for ‘a perfect world’ can and will lead to breakthrough measures that could significantly change the outlook of the future. Inspired by the national bestselling books Three Cups of Tea by Greg Mortenson and Leaving Microsoft to Change the World by John Wood, Tea Party Angels supports the work of these heroes and others who have devoted their lives to educate girls around the world. The goal is simple, only through education can we really achieve peace and prosperity.The Tea Party Angels concept is simple and will not require a lot of time or effort. Host a tea party in your home and invite other mothers and daughters to come and make a small donation. Mothers and daughters will enjoy working together to organize the tea party and being the hostesses, and the experience will be both fun and rewarding. Megan Kilroy is a senior at Santa Monica High. Growing up in Santa Monica with a father who is a county lifeguard, she learned to love and respect the ocean and its beaches. During her high school marine biology class, she was introduced to an organization called Team Marine, an environmental organization dedicated to making the Southern California waters safe and clean through research, education and community action. Her passion was sparked and went on to become Team Marine’s first appointed captain. Megan works tirelessly to educate and advocate for the health of the ocean, for marine life, and for the planet as a whole. Her projects include organized beach cleanups, presentations to students and educators throughout the state, lobbying on behalf of the environment in Sacramento and Washington, DC, testifying at city hall and marching to ban plastic bags in Santa Monica, and raising money through recycling to send LifeStraws (personal water filters) to children in Africa and Cambodia. Megan also captained and skippered Santa Monica High School’s first solar powered boat for the LA County Metropolitan Water District’s Solar Cup. The program focuses on renewable energy and water conservation, giving students like Megan a hands-on opportunity to learn about engineering, physics, solar power and more by designing, building and racing a 15-foot solar powered boat. Megan plans to study environmental sustainability and communication is college and hopes to open her own environmental organization/production company one day that educates the youth about environmental issues and supports them in starting their own eco-clubs. Hi my name is Johna Rivers, I am 16 years old and from Los Angeles C.A. I grew up in the city of Watts and have lived in the Jordan Down projects all my life. I am also a foster kid. Growing up in the projects I never thought I would have been this successful because all the people around me are negative but I started to hang around positive people and I became a positive person. I been through a lot of struggles in my life I fell down and got back up still standing strong that is where I’m from. Some things that I am interested in are music after Usher Camp I have started to write my own songs maybe this year when I return I will perform one of my songs. I’m also into sports and dancing. I teach my own dance class to keep the youth in my community out of trouble. I love to help other people out that is why I do volunteer work in my community and give back to my community in small ways. I am hosting a benefit to raise resources for kids like me in Africa suffering form Malaria and also for the kids in Haiti. It will be a dance concert with various groups from my neighborhood. This year I will be chair of the literacy committee for the afterschool Leadership campaign, involving middle school students from my community to write essays on ways to stop violence. My accomplishments are participating in Better Youth’s Beauty Boot camp, Usher’s Camp New Look and being able to meet new people from every where. Being able to be in the Beyond the Bell leadership campaign is some thing I always wanted to do and now I’m apart of that program. I also went to a Leadership camp in Malibu California with the and attended a leadership training with student leaders from all over the city of LA. I made front page in the Beyond the Bell newsletter. The event that I am doing for Usher’s camp is to help raise awareness and funds for malaria to help fight the disease and try to defeat it I named it “African dance against Malaria” because I am going have a dance performance and I am going to have my dance class do an African cultural dance. The event will be held at Youth Opportunity High School in my community in March 2010. I want to start a non-profit and run my own business one day. I hope to attend college when I graduate.